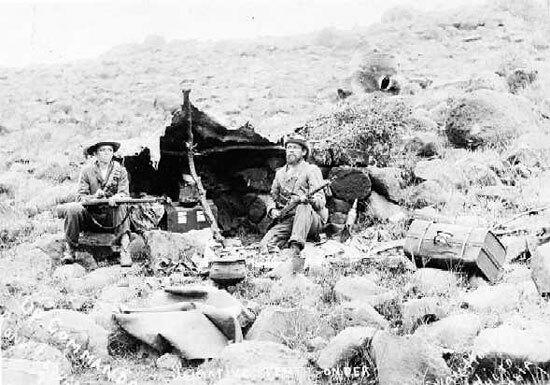 Conflicts between the Boers and the British over the huge gold reserves discovered in The Transvaal increased. The war began when the Boers gave an ultimatum to the British to cease reinforcement of the British garrison in South Africa. This happened because The South African Republic had refused to grant political rights to the Uitlander (foreigners, mostly English) in the mining areas, and the English were aggressively persistent about it. On Oct. 11, 1899, the fighting began. The British eventually had over 400,000 men in South Africa. The Boers, at their peak had 52,000, using boys as young as 9. In addition, the Boers were mostly untrained farmers, fighting what was perhaps the greatest power in the world. So the match was uneven from the start. However the Boers were fighting on their home ground and used unconventional guerilla tactics to good advantage. They achieved some early victories over the British. Due to lack of supplies and concern over their families, the Boer Republics finally surrendered their independence in 1902. In return they got assurances that the question of African rights would be put on hold. The war was over and all of the colonies of South Africa were under the control of the British. In May of 1910, a new country was created, the Union of South Africa, ruled by the British inhabitants. Dedicated "To Our Heroines and Beloved"